I've said this quite a bit already, but I love my Kindle that I received last Christmas! It's a really excellent device, and what makes it really stand apart is the E-Ink technology, which is fantastic. However, I don't have the new Amazon Kindle, and I am a little curious to know if any of you have purchased it, and how it compares. I am especially interested in the Kindle Touch--what do you all think? Is it easy and enjoyable to use? If you don't have one, are you looking at buying one? 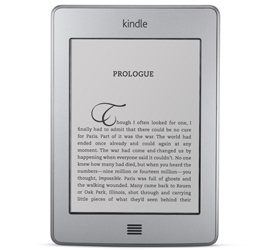 Are you thinking of purchasing the latest Kindle? I'm seriously considering buying it. Since my Kindle is only like a month old, I think I might be able to fetch a reasonable price in eBay and use the cash for the new Kindle. I'm pretty convince it will be a good buy after reading this review - http://www.theverge.com/2011/11/14/2559732/kindle-touch-review/. I have been debating for the longest time about getting an ereader, I think I have finally decided which one I am going to ask for Christmas. After viewing some of the videos on YouTube comparing Nook and Kindle and reading about them, I think I want to get the new Kindle Touch. I'm curious to see how it compares to the Nook simple touch. I'm still trying to decide which ereader to get, my dad said he'll buy me one for my birthday but I'm not sure which one to get. I don't have the Touch but I did buy the new $79 version. My 1st Generation's screen busted about a month ago so I replaced it with the cheaper version. Why? Because I know something better will be out in a year (Kindle Fire 2?) so I'll save my money and just get by with this minimum. I don't think I'd like the Touch too much. What about all the fingerprints?! I do dislike the keyboard on the new version though. I much preferred the 3G w/ Keyboard.